I have very little knowledge of systems, particularly equipment. Currently on my second small system that will power all our external lighting at night for 12 hours, 10w led each at 12vdc. The system is currently on a bench ready to go up. In the system is a "Valve regulated sealed AGM/GEL 12v battery". In the document for this battery on maintenance it demands a full discharge every 6 months. The reason for choosing this battery is that I live in Thailand and solar is decades behind the west. Not many options available here. So I know zero about this battery, it's rated at 35ah. So my one question is what is the best method to do this? I would prefer to cable some device into the circuit for convenience. How do you guys get round this? PS; if someone knows this battery type I would love some pros/cons of this design. In Thailand everything is available, you just need to know where to look, it can be challenging at first dealing with local suppliers, personally I found it easier to order from China directly, there is no tariff on batteries, keeping the orders on other stuff below $50, on paper at least, results in no duty or taxes. If you need some pointers just ask, I can send links to dealer locally, and where to get almost everything needed. Outside Bangkok it difficult, I'm in the Udon Thani area so understand the apparent lack of vendors, but they do exist. IMHO, demanding a "full discharge" (taking to dead) any lead acid battery regularly sounds like a good way to sell more batteries. Maybe it should read "fully recharge" (and/or "freshening" charge)? AGM pros (generally speaking, relative to flooded); lower self discharge, ability to handle higher charge and discharge rates, don't have to be mounted upright, little/no gassing, no need to check SG or water levels. Cons; can't check SG or add water (harder to catch/remediate charging issues), more expensive, tend to have shorter life in deep cycle applications, more sensitive to permanent damage from high charging voltages. And one thing to add to Estragon's AGM comparisons... AGM batteries when they "fail", they do gas (over charging, end of life charging after catalyst wears out) hydrogen gas (and electrolyte fumes)--So you still want to be careful how you vent and where you install them. Thanks all for your input. Regarding full discharge I have never heard of this as a battery maintenance issue so I will need to research furher. @mcgiver - I am in Khon Kaen province about an hour from Khon Kaen city. I have seen high end equipment in shops such as Do Home and Home Pro and Global House. Mostly heavy duty systems for farm applications. But I'm on the lower end of systems and these components are hard to find. These products also appear to be very expensive here. Like you I've sourced everything from China except the battery. Appeared to be reasonably priced for the ah. I bought it from Lazada, by the company name of Solar Thailand but notice it's made in China. My current project is just about finished, just need to put it up. My next project is a solar generator. It will need to be fairly powerful as its main task will be to run our bore pump rated at 1.5hp. We have a real issue here with people burning off their sugar cane. They simply light a fire and leave. It's a yearly occurrence that we have to fight fires to save our house. I need a generator in case the mains power goes out and we have a fire. A newer piece of equipment that (appears) to have become quite popular is the VFD (variable frequency drive) that is designed/configured to connect to a solar array (for power) and to a 3 phase motor for pumping water. The VFD varies the frequency (and voltage) to the 3 phase induction motor based on the amount of sun and pumping needs (slow down when less than full sun, speed up/slow down to keep a fixed pressure, etc.). If you can "live" with variable water flow (irrigation pumping to pond, etc.) 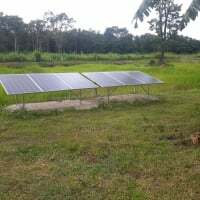 VFDs are a good option and probably the entire system will be 1/4 the price of a full off grid solar power system (array, charge controller, battery bank, AC inverter). For things like fire fighting--Gensets or gasoline/diesel powered pumps where you need a large amount of water at anytime of day/night--Is the way to go. DO NOT DISCHARGE COMPLETELY!!! That is how you kill lead acid/gel AGM. Never go below 50% discharge if you want it to last 10 years. So if your battery voltage gets to 12.1 or 12.0 your at half,, do NOT let it get lower, you greatly shorten the life of the battery. And I'll say again, DO NOT discharge your battery completely, it like knocking a year off the battery life each time.